On ﻿January 17﻿, an ﻿FDA advisory committee﻿ convened to advise whether to approve Zynquista, a once-daily SGLT-1/2 dual inhibitor pill for adults with type 1 diabetes (in development by Lexicon and Sanofi). The committee, comprised mainly of endocrinologists and cardiologists, was split down the middle, with 8 voting yes and 8 voting no. During the Open Public Hearing, 17 out of 19 patient advocates spoke in favor of approval, including The diaTribe Foundation. For background on Zynquista, click ﻿here﻿. Four SGLT-2 inhibitors are approved for people with type 2 diabetes: ﻿Invokana﻿ (canagliflozin), ﻿Farxiga﻿, (dapagliflozin), ﻿Jardiance﻿ (empagliflozin), and ﻿Steglatro﻿ (ertugliflozin). None of these medications are approved for type 1 in the US. Currently, the only non-insulin treatment approved for type 1 is injectable ﻿Symlin﻿ (pramlintide). However, some people with type 1 are already using SGLT-2 inhibitors “off label,” meaning without FDA or other global regulatory approval. Although the Committee’s vote does not determine the FDA’s final decision, Advisory Committees are key in the drug approval process. The FDA will consider information and opinions presented by Sanofi and Lexicon, committee members, and the public during this meeting as it decides whether to approve Zynquista. Based on the 8-8 vote, it seems likely that the FDA will move ahead with the drug when it has more information on risk management. 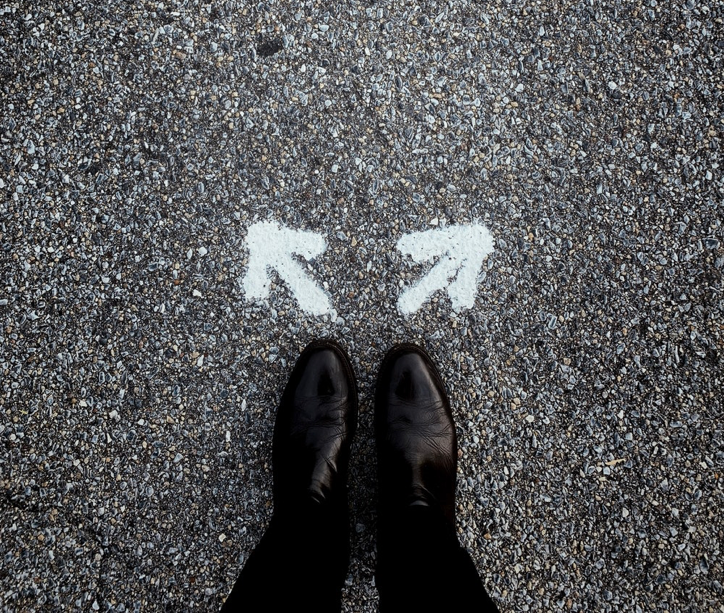 Overall, we believe it’s more likely that the FDA will require a comprehensive risk mitigation strategy (i.e., a conditional approval process known as REMs, such as Accutane’s extensive patient education program) or request further studies that address safety concerns. Either of these options would delay a potential approval. What factors were under consideration? SGLT inhibitors, taken in addition to insulin, can make a significant difference for people with type 1 diabetes by increasing time-in-range and reducing weight, insulin doses, A1C, and blood pressure. During the Open Public Hearing portion of the meeting, many of the patient advocates emphasized how these benefits translate to meaningful improvements in day-to-day quality of life – a nod to the ﻿Beyond A1C movement﻿. A large part of the discussion revolved around whether these improvements are clinically meaningful and whether the clinical trial data support the anecdotal evidence from patient and healthcare provider testimonies. Most of the panel appeared to recognize the importance of hypoglycemia and weight loss, and we believe FDA certainly acknowledged in its presentations the importance of these patient-oriented factors. The eight committee members who voted in favor of approving Zynquista for type 1 all emphasized the need for ketone monitoring, increased education for both patients and providers, and a protocol to follow for DKA risk management. Additionally, figuring out the optimal dose of insulin is extremely important to determine when taking an SGLT inhibitor –too much insulin can cause hypoglycemia (this happens for some who take on the additional medication) and not enough insulin can prompt DKA. Can the DKA risk be reduced? The short answer is yes. There are already some healthcare providers who have successfully helped their patients get on an SGLT inhibitor with very few instances of DKA, such as Dr. Anne Peters, who gave a riveting talk during the Open Panel Hearing. Unfortunately, the reality is that many people may not have access to ketone monitoring, such as blood ketone meters (recommended over urine strips). Aside from the fact that ketone monitors and strips tend to be expensive and not universally covered by insurance, many healthcare providers are not trained to deal with the unique challenges of SGLT inhibitor-induced DKA. Read our deep dive on SGLT inhibitor use in type 1 diabetes here, as well as a guide to making sense of ketones here. To help guide people with diabetes as well providers and regulators, a group of experts came together in 2018 to outline best practices for safety and efficacy in a paper that will be published in Diabetes Care. 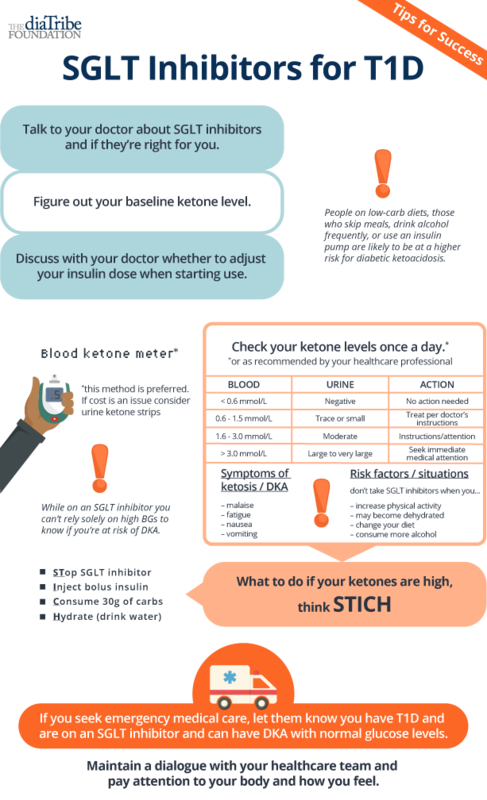 To summarize the paper, we created an infographic that illustrates steps to take when considering and taking an SGLT inhibitor as a type 1 patient. What do people with type 1 who've used an SGLT inhibitor have to say? Ahead of this Advisory Committee meeting, we partnered with six type 1-focused groups to gather stories about type 1s using SGLT inhibitors “off-label.” Over the course of 3 weeks, we received 217 responses. Although these stories are not wholly representative of the entire type 1 community and are far from scientific, we learned a lot about people’s experiences taking these medications in the real world. 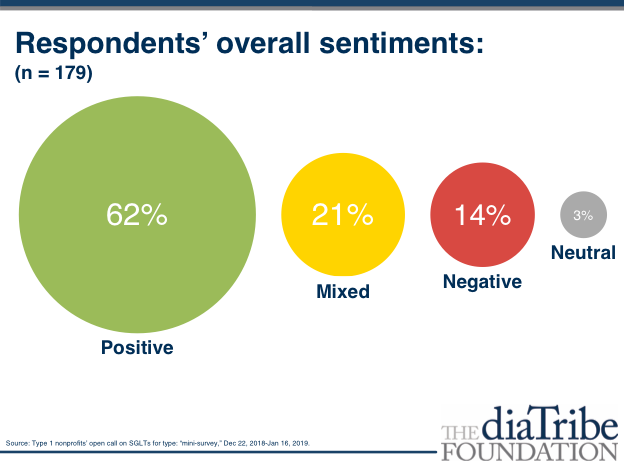 Of the 179 people who have taken an SGLT inhibitor, 62% of responses were positive. Consistent to clinical trial findings, there were 17 people who experienced DKA and about 50 people reported other side effects such as a UTI or yeast infection. 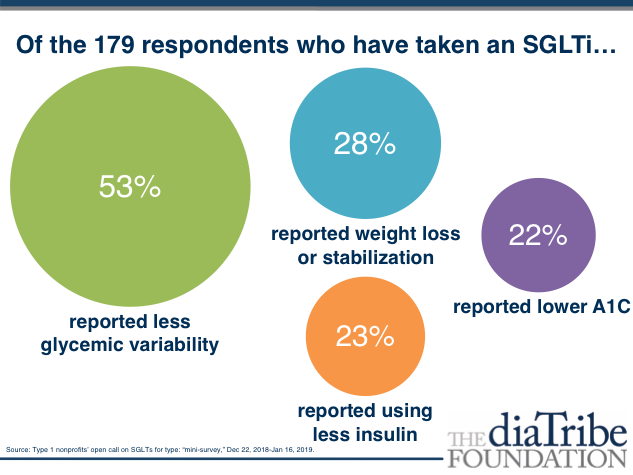 The upside is enormous: unprompted, over half of people said they experienced less glycemic variability, 28% said they lost or stabilized weight, 23% reduced their insulin dose, and 22% reported lower A1Cs. All of the survey responses (identifying information removed) can be found here. We applaud the researchers and companies for taking on this project – unmet need is giant in type 1 diabetes and for some, this will be an excellent way to manage diabetes better. As one patient said – taking an SGLT is like “bowling with bumpers.” Additionally, we thank Beyond Type 1, Children with Diabetes, College Diabetes Network, Diabetes Sisters, T1D Exchange, and Tidepool for working to bring patient voices to the meeting. As we await FDA news on this front, we emphasize the need for patients as an entire population to be as safe as possible and that those who have the ability to take on use of this medication have the opportunity to do so. We are especially excited about this possibility because people with type 1 may then be able to test these medications in a long-term heart health outcomes trial, as suggested by Dr. Irl Hirsch. Lots will have to go right to reach such a milestone, but we believe it is possible! In the meantime, we’re staying very tuned.